Times of Zambia | Well done Zesco! Sport On with Elias Chipepo – ZESCO United will only have themselves to blame should they fail to make history for Zambia by reaching the 2016 CAF Champions League semi-finals. This promises to be Zesco’s biggest chance of inching closer to claiming their hands on the Champions League title, and only them-will blame themselves should they fail to achieve this historic feat. Why do I say so? Zesco have matured this time around in the campaign having learnt valuable lessons from the past participation and early eliminations though I strongly feel they should have beaten ASEC Mimosas on Wednesday and eliminate the Ivoirians from the equation. The good part, however from their performance was that the Zambian champions continued to show a lot of improvement and know what they are doing this time around. Playing in West Africa is never easy but Zesco seem to have handled that very well, a sign that George ‘Chicken’ Lwandamina and his group really went back to the drawing board to plan. But there is need to avoid the common horror of stumbling at the last hurdle. As it stands, qualification is in Zesco’s hands as they are joint leaders on seven points with Wydad Casablanca while ASEC and Zamalek are three points off on four points. It will be important for Zesco to continue working hard and ensure that they do not lose focus of a historic semi-final appearance, which would make some amends on the country’s failure to qualify for the Gabon 2017 Africa Cup of Nations finals. Zambians will not want any excuse after the August 12 match away to Al Ahly as they want qualification to be attained and not the excuses of the match having been an eye opener. I wish Lwandamina all the best as he prepares his squad for this important task and hope the Football Association of Zambia will continue to be lenient and not pile many fixtures nearer to the game to enable Zesco prepare well. Time to win the title is now, and also time to remove the underdog tag is rightfully now as Zesco deserve to rewrite the history books. Lastly, congratulations to the Zambia Draughts Federation for successfully hosting the African-64 Championship at the Olympic Youth Development Centre in Lusaka to put the country on the world map. Hope the federation can continue with this spirit by ensuring that the sport is played competitively because Zambian players showed a lot of potential. Despite not winning the main event, Zambians Lukanga Mambwe and Elias Munkondia did the nation proud by winning gold and silver in the Rapid event. Good luck also to the Zambia under-17 team as they face Namibia for a place in the finals of the COSAFA under-17 championship in Mauritius. 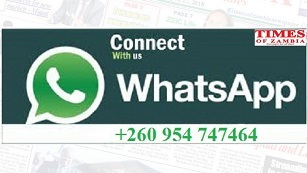 Till next week, let’s continue interacting on eliaschipepo@gmail.com or elias.chipepo@times.co.zm and on twitter @eliaschipepo.